Sunday, January 16th through Tuesday, January 18th, 2011, Covington, Louisiana: We enjoyed four days with our friends Johnny and Eileen from our early Navy days in Key West. Bill and Johnny spent most of the time telling sea stories as Kit and Eileen brought each other up to date on their doings. Johnny and Eileen undertook their own RV adventure last summer and we had the pleasure of hosting them and their twin granddaughters in Maine for a few days. On our first full day visiting they invited the rest of the family over to meet us. Below is a picture of the proud grandparents with their son-in-law and grandchildren. We enjoyed some great homemade Cajun cooking and for dessert we enjoyed a King Cake, a traditional Mardi Gras treat. The King Cake has a trinket baked inside called a “baby”. Whoever finds this small plastic figurine has to provide the King Cake for the next gathering…..as luck would have it, Johnny found the baby. “Pontchartrain Po-Boy and Seafood”. It really pays to know where the locals eat when visiting a new area. The food was excellent and plentiful. 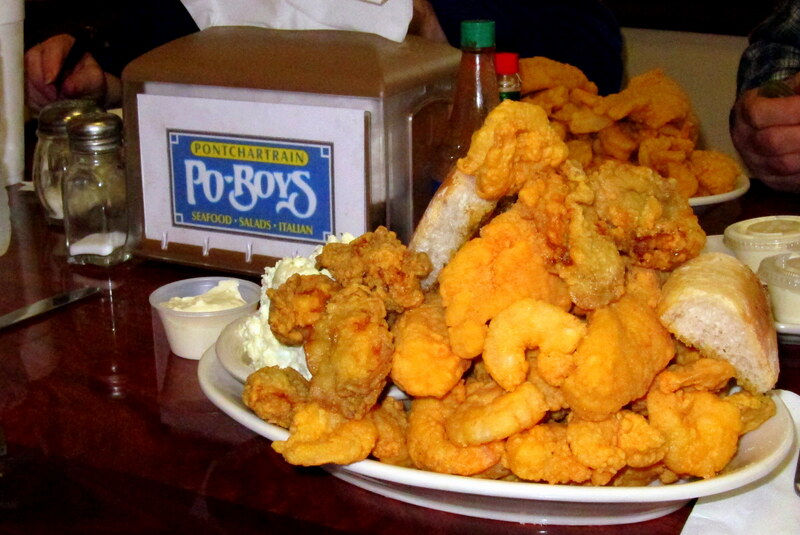 That mountain of catfish, oysters and shrimp is not sitting on a pile of fries…..that’s all seafood folks! Oh, for you Yankees, a Po-Boy is kinda like a grinder…..with twice as much stuff between the bread. Another day, Johnny and Eileen drove us to New Orleans. We crossed Lake Pontchartrain by way of the 24 mile bridge, the longest in the United States, and they showed us around the area where they grew up. 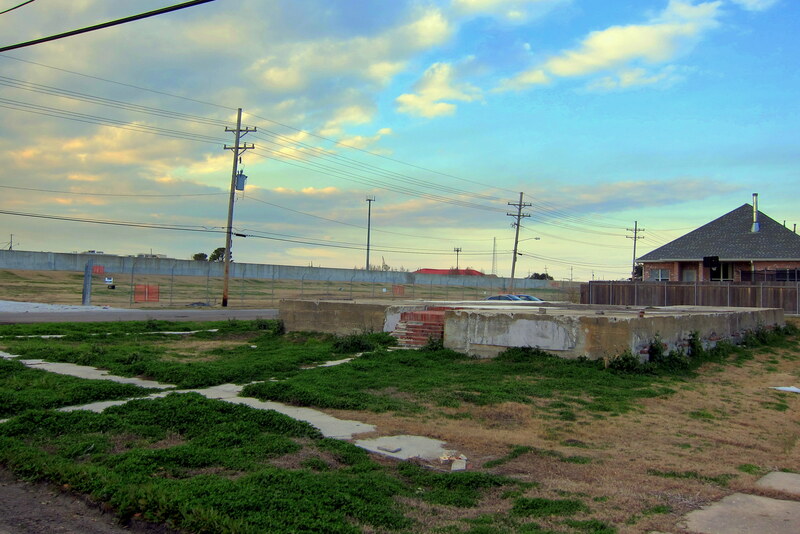 Touring the 17th Street canal area, we witnessed lingering effects of Hurricane Katrina and the considerable rebuilding effort. There were many homes that are still uninhabitable as well as properties with only the foundation remaining. One such lot is the former home of one of Eileen’s relatives. That levee in the background holds back the water in the canal and is considerably taller than in pre Katrina days. 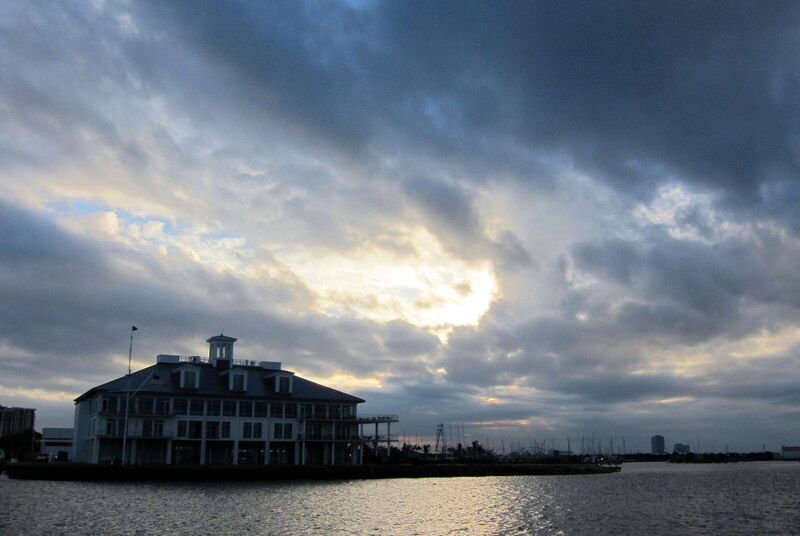 As a sign of optimism the New Orleans Yacht Club was rebuilt…..on the same footprint, right on the shores of the lake. Johnny told stories of his childhood days where he made a pirogue (pronounced pee-rog) and dragged it up and over the levee to paddle and fish in Lake Pontchartrain. Another story has young Johnny swimming, or paddling his pirogue down the many canals, much as kids would bicycle down a street, in order to visit a buddy’s house, get to the store or visit his father who worked on the lake. Near their old neighborhood we stopped to walk the levee that holds back Lake Pontchartrain. Even knowing that this area sits at approximately eight feet below sea level it is still amazing to walk up the steep levee, stand on top, and see the homes and businesses on one side and high water on the other. All the water that accumulates in the city from minor levee leaks or rainfall is controlled and evacuated by an intricate system of canals and pumping stations. However, as the experts have discovered the city being below sea level had very little to do with the devastating effects of Hurricane Katrina. The section that sustained the worst flooding was largely near sea level and was flooded by the massive storm surge breeching the levee in that area on that fateful day. The low elevation of the city did complicate the dewatering and rescue effort however. All in all, a great day in an old historic city that has seen more than its fair share of troubles. Most everywhere we went in New Orleans we were impressed with the warmth and vitality of one of Americas great cities. 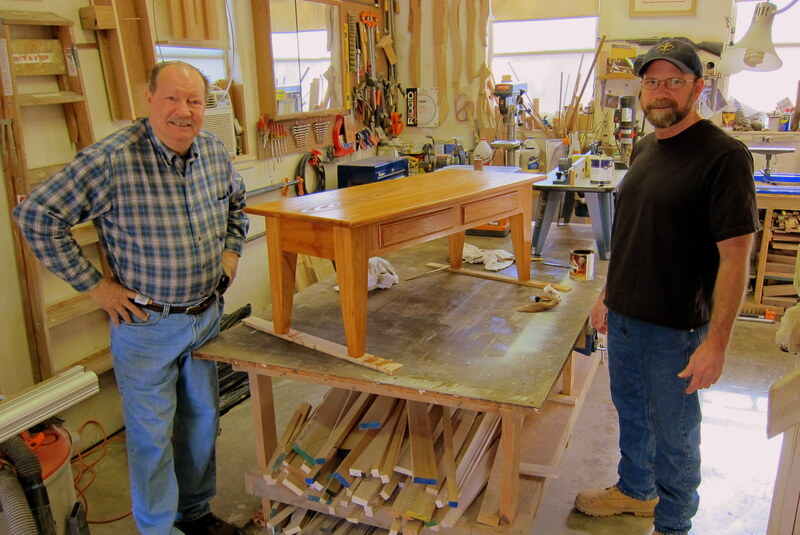 Like me, Johnny is a woodworker so we spent a lot of time talking tools and projects. Johnny is busy building his dream shop in a 1200 foot building he has recently constructed behind his house. In addition, he has befriended a neighbor, Dave, who is a professional furniture maker and does incredible work out of his relatively small two car garage. The piece Dave is working on above is made of Swamp Cypress, the official state tree of Louisiana, and is a beautiful addition to other custom pieces he has constructed for a local customers home. Like Kit and I, Dave is an escapee from California. In addition to building fine furniture he is an accomplished musician having recorded with a few west coast bands as well as some New Orleans jazz bands. 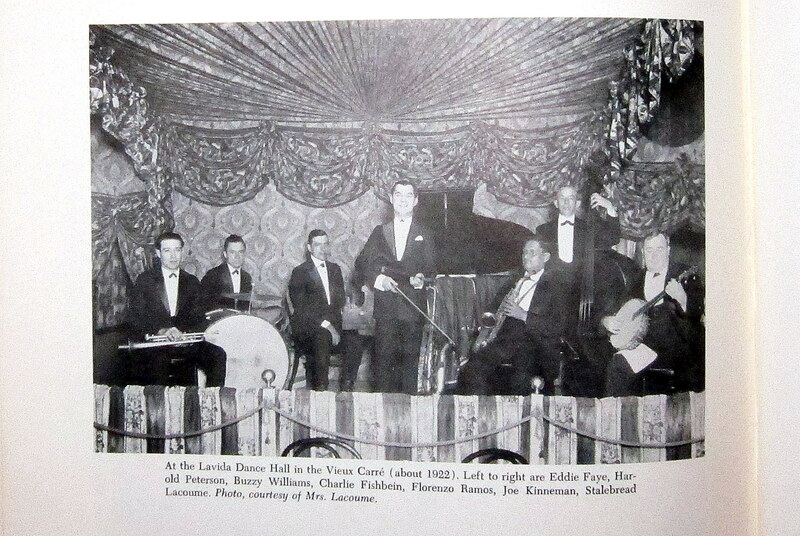 Speaking of Jazz Bands, Eileen’s grandfather was Emile “Stalebread” Lacoume a blind musician who lived in the New Orleans area in the late 1800’s. Stalebread has been credited by the New Orleans Jazz Hall of Fame as one of the originators of the New Orleans Jazz sound when in 1897 he founded The Razzy Dazzy Spasm Band; a rag tag group of very young street musicians. 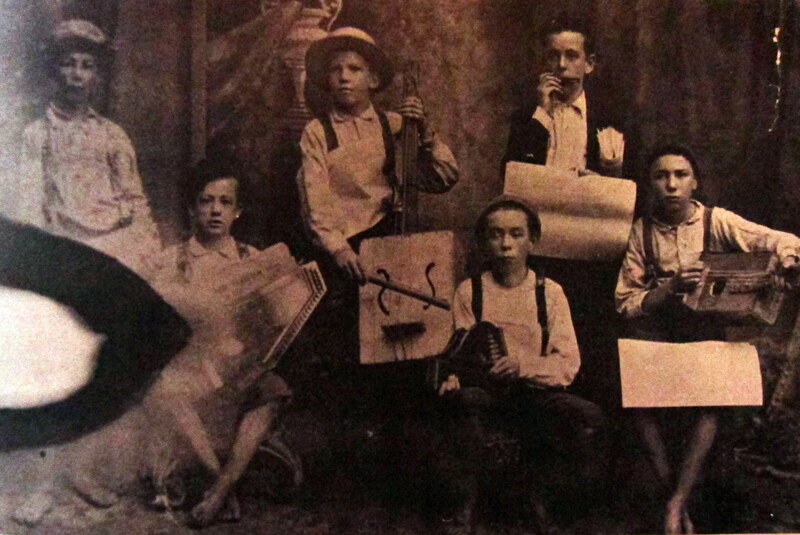 Young Stalebread (second from left) made a lot of the bands early instruments and taught himself how to play the guitar and banjo by listening to the Skiffle Bands of the era. Louis “Satchmo” Armstrong was a young musician who played for the aging Stalebread who then commented “that boy’s got chops”. Evidently Stalebread had a great ear for music as Satchmo went on to be one of the greatest Jazz performers of all time. Below is a more recent photo of Stalebread (far right) and The Razzy Dazzy Spasm Band. Kit and Eileen spent part of one day shopping. While they were at the local grocery store they were caught goofing off by the butcher and generally causing a ruckus. The girls took a liking to the handsome fellow but alas old Lazar Wolfe the butcher was still pining over Tzeitel from back in his hometown of Anatevka. So they made do with the retired Lutheran Minister who happened along next. The three of them had a grand old time visiting and playing with the fresh fruits and vegetables. Alas…..all this fun must come to an end as we need to continue our westward trek. Tomorrow we plan on spending a great deal of time on some Southern Louisiana back roads. We had a great time visiting with our friends in Covington. 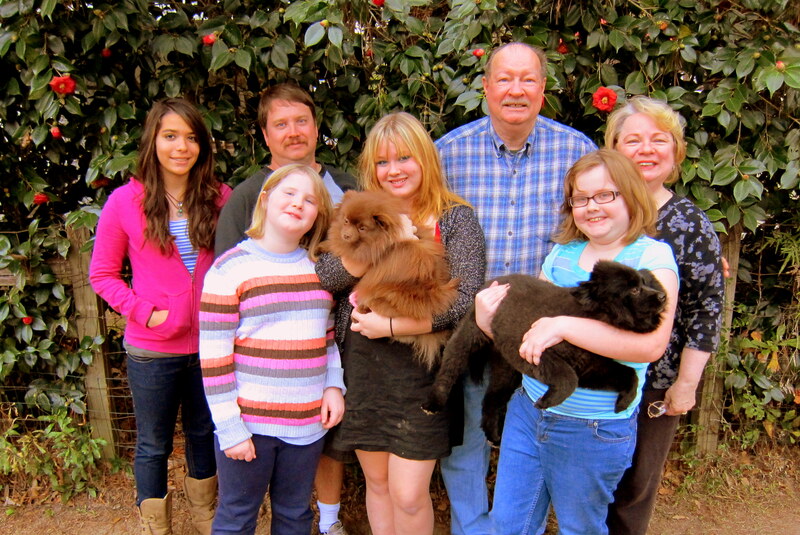 We thoroughly enjoyed the family gathering with their son-in-law, granddaughters and one of their friends. We also loved the tour of the outskirts of New Orleans to see the effects of Hurricane Katrina and the rebuilding effort. This entry was posted in 2011 Excellent Adventure. Bookmark the permalink. Note to Stan…not like the flight check that made the news, huh? Kathie and Bill…keep on enjoyin’. We are! Hey you two – I’m so glad to be back on this list!! It’s fun to read this journal entry in particular as I just returned from visiting ‘the homeland’ myself. The picture of the fried catfish made my mouth water!! Next time you’re in Louisiana, you should also check out Middendorf’s, Catfish Charlie’s and/or Don’s Seafood. Wicked good catfish and crawfish!! Can’t wait to read the rest of the entries and see what other adventures you have had. I read in your “travel diary” that your friend, Eileen (Lacoume Laurencis) is the granddaughter of Emile Stale Bread Lacoume. As an author and music researcher working on early N. Orleans bands, I’d very much like to speak with Ms. Laurencis about her grandfather. Would you be willing to make the introductions? If you go to my website, you’ll see more about the music books I write and can read some reviews of my work. Any help in this matter would be much appreciated. Hi Gary, will contact you via e-mail with Eileen’s contact information. I did take a look at your website and am impressed…..that is a great body of work! I am doing some research for a new book and will feature the Razzy Dazzy Spasm Band in it and notably Emile Lacoume. I am most interested to know if you can tell me what the circumstances were surrounding his blindness? I would also be interested in speaking with any relatives about him.